Network Tasman supports EVolocity Challenge to help equip region’s students for careers in design, engineering and technology. Excitement is building as teams complete their entries for this year’s regional EVolocity Challenge, sponsored by Network Tasman. The EVolocity Challenge engages teams of students around the country in designing and building an electric vehicle using an electric motor componentry kit provided by EVolocity. Nelson Tasman teams are set to showcase their creations at the regional final at Trafalgar Park from 5pm on 19 October. This year, six schools from Tasman are taking part; Nayland College, Garin College, Waimea College, Tapawera Area School, Golden Bay High School and Motueka High School. The Head of Department for Technology at Moteuka High School, Peter Allan, says the enthusiasm shown for the task by his school’s two participating teams has been incredible and builds on the success of last year’s team, which competed at the finals in Christchurch and was the overall winner of the national EVolocity Challenge. “Last year four year 12 students from engineering, science and computing subject areas worked together to design, plan and construct an electric vehicle,” says Allan. “The engineering boys Dale and Kendall were responsible for the construction, with all students involved in the design and planning. Lawrence from computing did the programming of the vehicle to make it run and built a website which told everyone what was happening and the progress being made. Hannah from science did the electronics and wiring. The increased range of skills in all areas was immense and all the students were highly challenged. 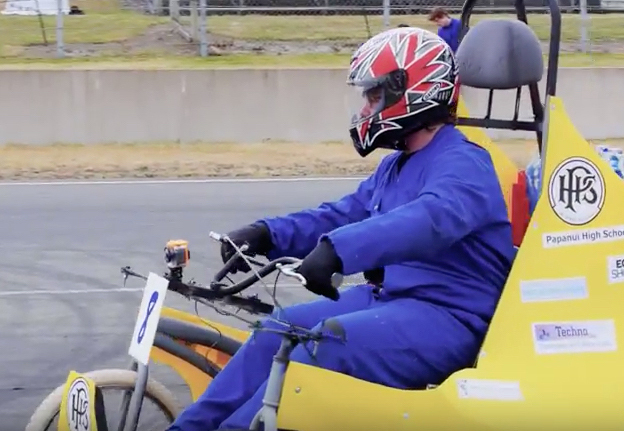 Network Tasman’s CEO Oliver Kearney says the company is proud to sponsor the Tasman EVolocity Challenge, particularly given the company’s own interest in electric vehicle infrastructure. Meanwhile Peter Allan says that the level of public interest in the students’ work has been remarkable. “After last year’s EVolocity Challenge finals in Christchurch we displayed the kart at the local A & P show. The vehicle was just inundated with people all day and the questions ranged from the building and racing of similar vehicles to questions about what transportation might be like in the future. We also displayed the kart at Richmond Mall and the feedback was fantastic. People are interested.